Once upon a time, an American teenager fell asleep on a tour bus in France. Nudged awake, she looked up to see the panorama of an unfamiliar city before her. Except for one thing. 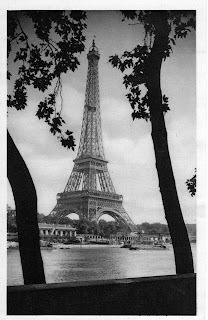 The Eiffel Tower loomed in the distance. It's real, the young American thought. Her dream had come true. 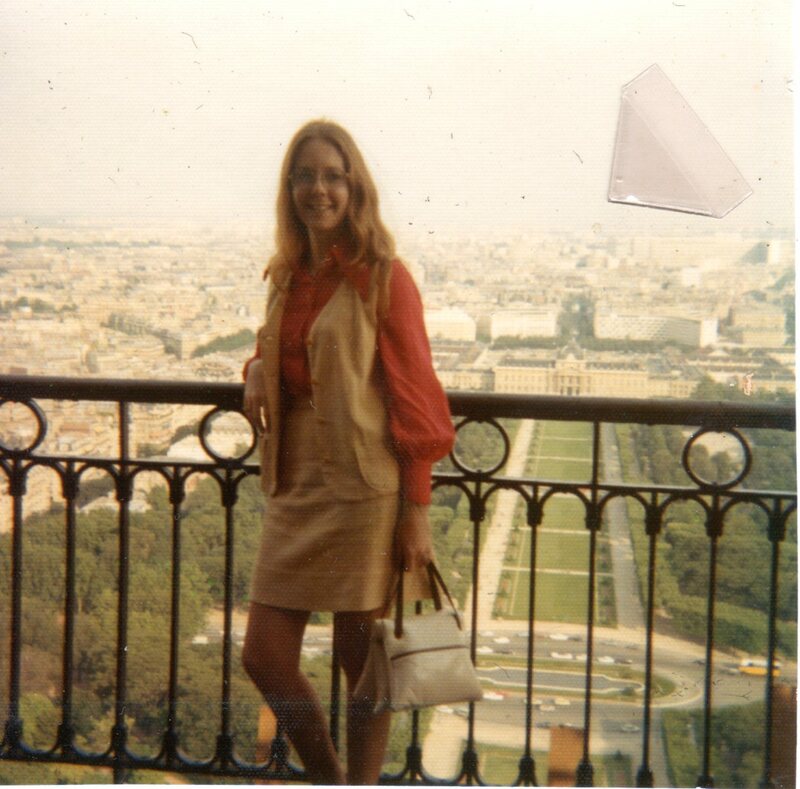 She was in Paris. And she burst into tears at the realization. I was that American teen and it was 1971. 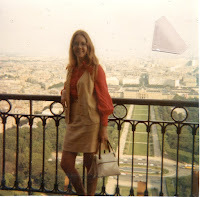 Here I am (at right) the next day, taking in Paris from the lower deck of the Eiffel Tower. Whether you've been to France or not, chances are you recognize Gustave Eiffel's cast-iron monument. You may even have some version of it in your garden or a photo or poster hanging on a wall. My high school French teacher's desk featured a ridiculous little bronze Eiffel Tower with a thermometer attached to one side. I remember thinking it would make anyone's list of "stupidest souvenirs." Then again, that was years ago. Now I have my own Paris kitsch (and yes, I know it's awful but it's so awful I love it I mean, seriously ... a perfume bottle with colored water ... what's not to like LOL). 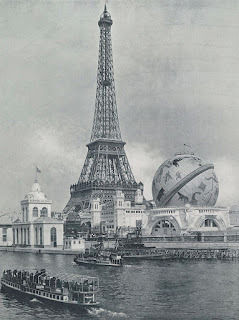 Eiffel's design was selected from 107 proposals in 1887 to showcase the 1889 Universal Exposition in Paris (which celebrated the centennial of the French Revolution). I remember my French professor telling me it was essentially a giant Tinker Toy. What he meant was that all 15,000 metal parts were prefabricated and numbered for assembly, and most of the 2.5 million rivets were already in place before the tower went up. Three hundred steelworkers worked around-the-clock for twenty-six months. Without a single fatal accident, the world's tallest building (until 1931) was finished just one week before the exposition opened. Parisians have strong opinions about any new monument, and they greeted the Eiffel Tower with a mixture of horror, criticism, and public dismay. Author Guy de Maupassant took to dining on the second-floor Le Jules Verne restaurant so he wouldn't have to look at it. A formal protest published even before the tower was completed began, "We come, we writers, painters, sculptors, architects, lovers of the beauty of Paris ... to protest with all our strength and all our indignation ... in the name of French art and history under threat, against the erection in the very heart of our capital, of the useless and monstrous Eiffel Tower." Satirists called it names. "This truly tragic street lamp." "This hollow candlestick." "This belfry skeleton." "A disgusting column of bolts and sheet metal." Regardless of the protests, the tower--initially intended to be temporary--was a resounding success. After Mr. Eiffel himself opened it, climbing the 1,710 steps to place the French flag at the top, the tower welcomed twelve thousand visitors a day. It's estimated that over 120 million have seen it since. In 2001, my children and I emerged from a Metro station at night to be delighted by a surprise view of the tower illuminated from within by modern lighting installed in the 1980s. It never sways more than 2.5 inches. From the viewing gallery, it's possible to get a distant view of Chartres Cathedral (45 miles away)--on a clear day. Gustave Eiffel designed the framework for our Statue of Liberty. In 1971, one of my friends and I entered a tower elevator and braved a conversation in French with the elderly gentleman operator. My friend asked, "Do you dislike Americans?" The sweet old man pointed to a pin on the lapel of his suit coat (it designated him as a WWII veteran) and proceeded to tell us that he remembered the Americans marching into Paris as the victors in WW II. "I love Americans," he said, "they freed my country." What about you? Have you visited the Eiffel Tower? 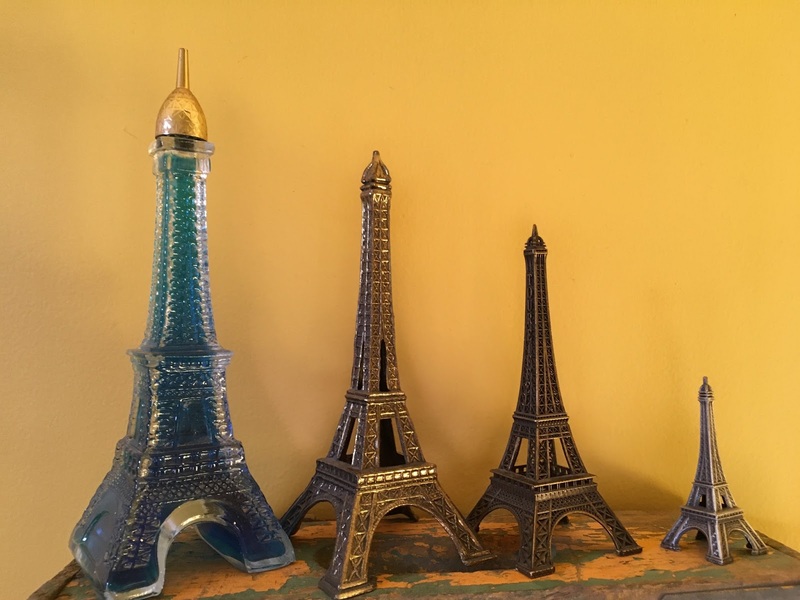 Do you own any Eiffel Tower kitsch? Stephanie Grace Whitson's novel A Garden in Paris introduces readers to Mary Davis, a widow who dares to believe "it is never too late to be what you might have been." 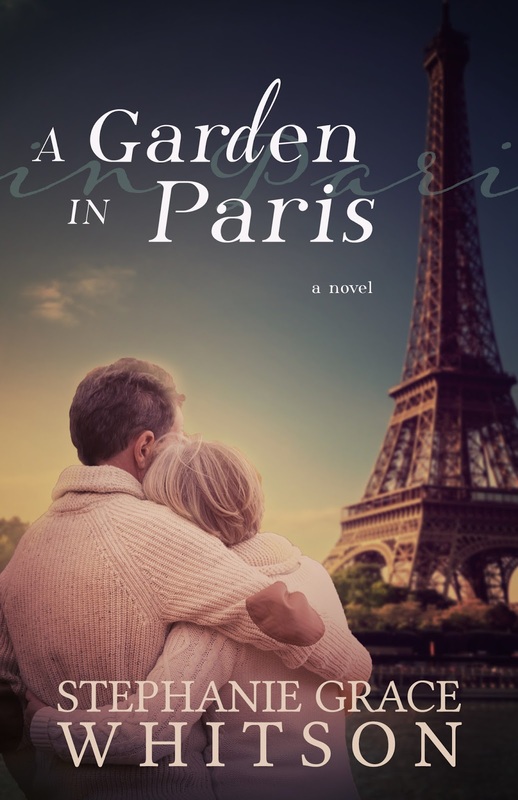 The Kindle ebook is only 99 cents.www.amazon.com/Garden-Paris-Stephanie-Grace-Whitson-ebook/dp/B06Y1F93VW. The paperback is $12.99. Paris is Stephanie's "favorite city in the world," and readers have said the city is almost a character in the book. If you've been there, A Garden in Paris will take you back. If you haven't ... beware. The story just might make you want to go. 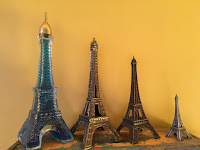 No, I haven't visited the Eiffel Tower, thus I'm not interested in any kitsch of the Eiffel Tower. Informative and an amazing experience for you, Stephanie. Thank you for sharing. I've never been abroad. Thanks for the trivia!! !